But damned if it doesn’t work beautifully for nearly the entirety of its two hour-plus running time. “Green Book” is the kind of old-fashioned filmmaking big studios just don’t offer anymore. It’s glossy and zippy, gliding along the surface of deeply emotional, complex issues while dipping down into them just enough to give us a taste of some actual substance. And its enjoyability comes almost completely from its starring performances from an excellent Viggo Mortensen and Mahershala Ali. Both actors imbue their roles with precision and pathos. They find nuance within their familiar types individually and share a spirited chemistry with each other. They are a joy to watch together from start to finish, even though you can tell from the beginning exactly how specific moments between them are going to play out by the end. In a racial flip of “Driving Miss Daisy,” nearly 30 years after that film won a handful of Oscars including best picture, “Green Book” features a white man serving as a chauffeur—and valet, and muscle, and all-around problem solver—to a black man. (That’s not to say the film is entirely free of icky white savior moments, but it does offer instances of Ali’s character rescuing Mortensen’s, as well.) The title comes from the travel guide of restaurants and motels blacks were allowed to frequent in the segregated South. But then, the possibility of employment comes his way that would allow him to provide real financial stability for his family, even though it would take him away from them for a couple of months. Ali’s Dr. Don Shirley, a world-class pianist, needs someone to drive him on a tour of cities across the Eastern Seaboard and the South, where he’ll perform in both concert halls and private homes. Shirley—or “Doc,” as Tony calls him—is everything Tony is not: educated, sophisticated, articulate, meticulous. And black. Tony may be a good guy, but he’s got some antiquated, misinformed ideas about African-Americans and more than a tinge of racism against them, as evidenced by his early reaction to a couple of plumbers working in his home. Clearly, all that is about to change. Ali brings an elegance to the role but also a moving vulnerability. When we first see him in his ornately appointed apartment above Carnegie Hall, where he’s dressed in robes and jewels and he’s literally sitting on a throne above Tony to interview him for the job, it’s easy to assume he’s simply going to be condescending and persnickety. But Doc reveals shadings and complexity as the road trip progresses, and he hints at the inner torment that’s driven him to build a refined outer shell. 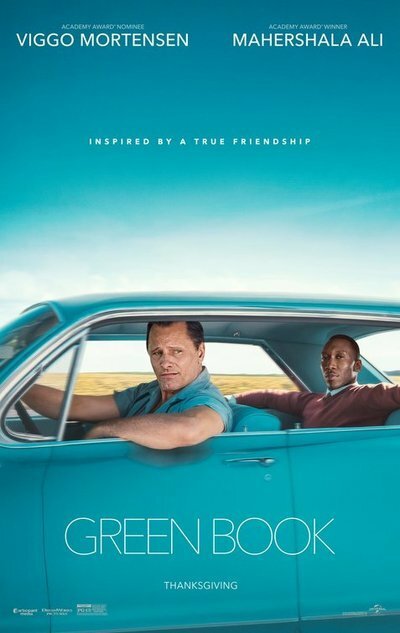 The main pleasure of “Green Book” comes from watching Tony and Doc banter as they make their way from town to town—trading small talk, getting to know each other and getting on each others’ nerves. Their distinct opinions on fried chicken and Little Richard, for example, defy traditional stereotypes. Quite often, their burgeoning friendship plays out exactly the way you expect it will. When Tony’s wife asks him to write her letters from the road, and he demurs out of embarrassment, you know it’s only a matter of time before Doc is helping him craft eloquent, romantic missives to send her. But other scenes offer some surprises in the details through which they’re executed. This is especially true in the powerful piano performances (achieved with the help of a body double, although Ali’s graceful demeanor is convincing). They indicate the transformation occurring between the two men as well if not better than their dialogue, especially during the final show of the trip, where many of the movie’s ideas about race and identity wrap up in joyous, satisfying fashion. You may actually find yourself getting a bit choked up by the end, even though you’ve been on this journey countless times before.